Snowflake Intermediate School is located in beautiful Snowflake, Arizona, just 25 miles north of the White Mountains. As part of Navajo County and the White Mountain region, we have a rich cultural heritage and a strong sense of community pride. 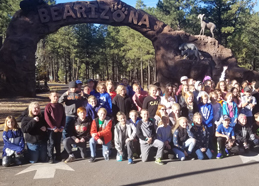 Our school—one of two intermediate schools in the Snowflake Unified School District—has been rated a highly performing school by the state of Arizona. With the new rating system, we are a “B” school—on our way to an “A”! In the pages below you’ll find more information about our wonderful school and staff.